This End Times Deception study will focus on Michael Rood, who positions himself as a Messianic teacher. Some Christians tend to trust Michael because he cites Hebrew sources. Michael claims that one cannot understand the New Testament from Greek, or from a Greek translation. The irony is that his Revelation prophecy fulfillment explanations are wrong, so apparently understanding the ‘Hebrew’ version of Revelation hasn’t helped him. I’ve used the Greek and English and I understand it just fine. That’s proven out on the Revelation Timeline Decoded website. Rood is not trained, certified or recognized as a Rabbi, and his “ordination” by a cult called The Way International (TWI) required only minor instruction in an unaccredited TWI program. The Way International was a free love cult that was founded by Victor Paul Wierwille, who denied the deity of the Lord Jesus Christ. Many of Rood’s teachings and practices are drawn from this cult which was widely denounced by Christian leaders and TWI’s ex-followers alike. Michael Rood rose to fame when he dogmatically and bombastically predicted that the prophetic “Day of the Lord” would begin on the Feast of Trumpets in the fall of 2000. Of course that didn’t happen, so he made excuses. Should you trust someone who got his education from a cult and who has past false prophecy teachings? He points to a futuristic one-man antichrist, but the saints have been proclaiming that it is the office of the papacy for 1,000 years; many of them paying for their witness with their blood. The Protestant Reformers rightly identified that the office of the papacy fulfills Bible prophecy as the Little Horn of Daniel 7, the Son of Perdition of 2 Thessalonians 2, and the antichrist beast of Revelation. Micheal Rood is not telling you those things, which deflects blame away from Rome. He points to a futuristic 70th week of Daniel, the supposed 7-year tribulation period. The concept of a futuristic 70th week of Daniel is a deception from the Jesuits of Rome, who created it to deflect blame away from the antichrist Popes. Here’s a study series which proves that the 70th week was fulfilled on time, after the 69th week. He teaches that Jesus ministry was only 1 year long, instead of 3 1/2. Here’s three events in John where it records that Jesus went to Jerusalem. Michael Rood claims that John 6:4 was added later and should not be in the Bible text. He says this leaves only two Passovers, one when Jesus started His ministry, and the other when Jesus was crucified, thus the one-year ministry. So let’s look to see if there is evidence that John 6:4 was added later. In 175 AD Irenaeus wrote an opposing response to Gnostic teachers, who claimed the ministry was one year in an attempt to have it correspond to the pagan zodiac. 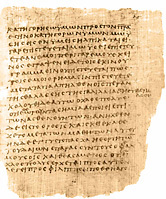 Irenaeus used John 6:4 as evidence to counter the Gnostic teachers, so the passage certainly existed in Irenaeus’ copy of John. This refutes Rood’s claim that it was added later. Not only do we have the testimony of Irenaeus in Lyons that the passage existed but P66 and P75, the two most important manuscripts we have of John’s Gospel (both date from about the 200 AD), contain the verse. The top Bible scholars do not say that John 6:4 should not be included. This includes Albert Barnes’ Notes on the Bible, Adam Clarke’s Commentary on the Bible, Coke’s Commentary on the Holy Bible, John Gill’s Exposition of the Entire Bible, Jamieson-Fausset-Brown Commentary, John MacArthur’s Study Bible, Matthew Henry’s Whole Bible Commentary and Pulpit Commentary. Once you throw out Michael’s argument that John 6:4 shouldn’t be included in the Bible, you can clearly see that the book of John mentions three Passovers, which proves that Jesus ministry was more than two years long. And that destroys Michael Rood’s theory about Jesus one-year ministry. Also of note is that his teaching is in direct opposition to the Word of God in the 70 weeks of Daniel prophecy, which clearly defines a 3 1/2 year ministry of the Messiah. It says that the Messiah would appear after the 69th week, in other words in the 70th week, which is 7 years long. His ministry started when He was baptized and anointed, and He began preaching the New Covenant to the House of Israel. It’s saying that He would be ‘cut off‘ (Daniel 9:26), meaning crucified, in the middle of the 7 years, which caused the need for the temple sacrifices to end. In this video, Michael Rood teaches about the futuristic “confirmation of the Covenant” that initiates Daniel’s 70th week. This is false teaching, as the covenant of the 70th week of Daniel is the covenant that Messiah came to ratify with His blood as the Passover Lamb. Some of what Michael Rood teaches is true and he makes some excellent points about the Holy Feasts of God, but he has a track record of false teachings, and I would warn people to stay away from him. Rood first published his zodiac-based calendar in 1998 with the assistance of The Way International alumni Robert Scott Wadsworth and Richard Fike. His background information is not accurate. What concerns me is the “Love Offerings” for his newest 1, one, CD for 50.00???? Greedy guy? This writing is such a load of nonsensical ignorance. Smoke and mirrors is what it amounts to. Please, prove my studies wrong. Until then, you’re the one who is ignorant!